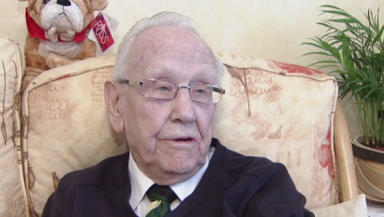 VIDEO: Former Japanese prisoner of war tells STV News of the horrors he endured and his incredible story of survival. Former Japanese POW Alistair Urquhart has broken his 65-year silence on the horrific abuse he received in the Far East - and his amazing story of survival. In a new book written by Mr Urquhart - titled The Forgotten Highlander - he tells how he survived torturous conditions, punishment beatings, being on a ship sunk by an American submarine and being in Nagasaki when the nuclear bomb was dropped. In an interview with STV News, which you can watch in the video above, Mr Urquhart said: "That first journey was one you wouldn't want to relive. There were corpses lining the streets and they had put heads of the natives on poles. "We were told we were going to a holiday camp. We were taken by train - the temperature was about 90 degrees, but there was no room to sit or lie down - you had to stand, and there were no toilet facilities. "The air was putrid for the five day trip. We stopped three times for a handful of rice. People were suffering from malaria and dysentry. Anyone who was really ill had little chance of survival. "Half way to Thailand we lost one person and the body had to be kept there - which wasn't a nice end for anybody. "When we arrived we walked 100 miles to the 'holiday' camp - it was just virgin jungle. They split us in half - half to make huts and half to build a railway." He added: "It couldn't have been any worse. There were continual punishment beatings. "For anything serious they made you go out in the sun and stand holding a huge rock above your head - if it fell you were beaten." Mr Urquhart was later transported to sea on a boat - which was then attacked by an American submarine. He said: "That really was another hell hole - I thought they were just going to scuttle it. "An American submarine attacked and the ship just shuddered. Then suddenly I popped up like a champagne cork in to thick, oily water. "I could hear men screaming - talking to their wives, calling out for their children, singing hymns. I can't listen to Abide By Me to this day. "I drifted for miles for five days - and I knew I had to keep awake. "I must have been in really bad shape - I have no recollection of how the Japanese whaling ship got me onboard."